"Twas the night before my skinning"
Imagine you were a young child living in the Northwestern part of Japan on the small peninsula of Oga. It's the holiday season and instead of waiting eagerly for fat jolly old elf with a sack full of toys to bring you presents, you're dreading the arrival of a bunch of hairy scary devils with a handful of butcher knives who threaten to peel off your skin if you've have been lazy all year. It makes the lump of coal Santa Claus leaves with naughty children pale in comparison. If you can get your head around that, perhaps you can understand this bizarre bit of psychological child abuse known as the Namahage. 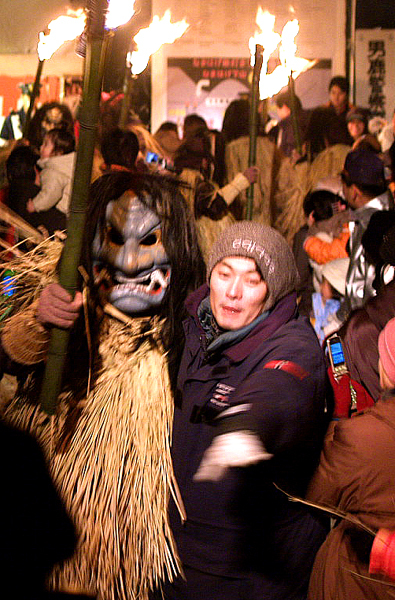 The Namahage are Japanese devils who visit villages on the Oga peninsula every New Year's Eve. They wear straw coats, carry large kitchen knives, and wooden buckets. 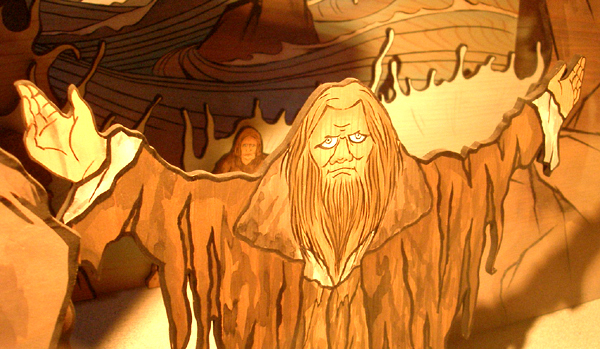 They come in the night down from their mountain homes howling and waving torches. 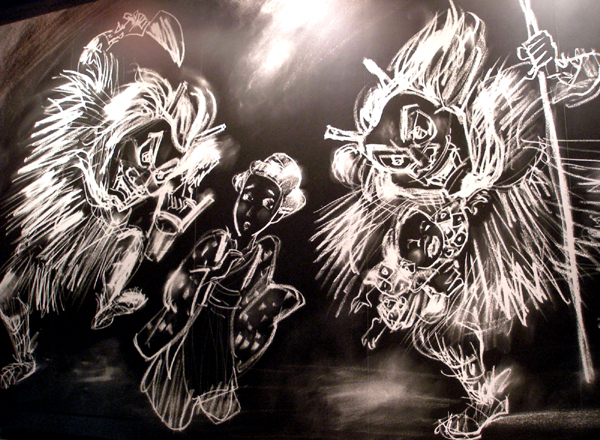 The Namahage burst into homes stomping about looking for lazy children. 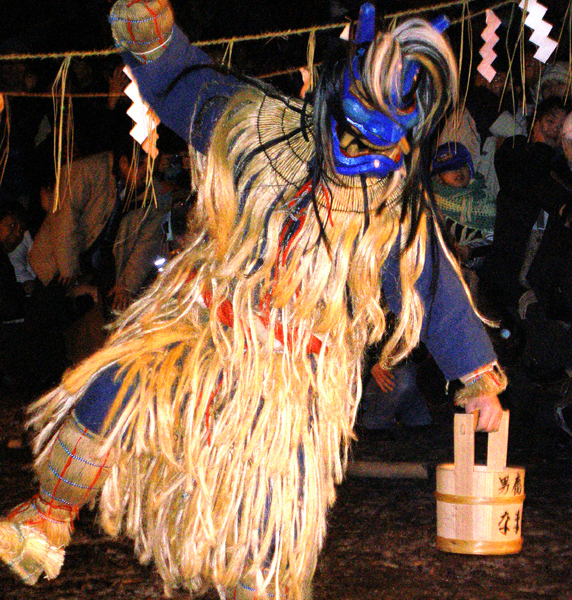 If the children are hiding, the Namahage will flush them out threatening to take them into the mountains. 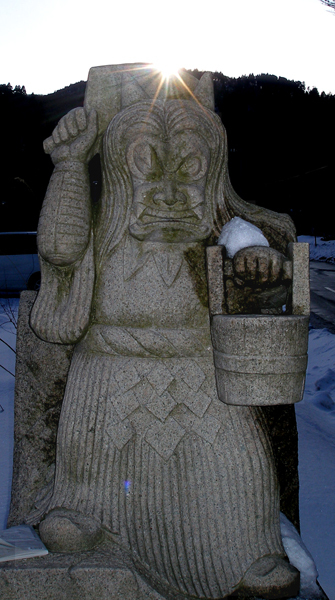 The head of the household will try to appease the devils with a specially prepared meal accompanied with sake. He assures them that no one has been lazy in his household. Then the Namahage, seeing all from their mountaintop, look into their secret book which records the doings of every household and challenge that statement. The head of the household again promises that all have been obedient and hard-working and pleads with the devils not to take his wife and children into the mountains. It takes considerable effort to control these devils with their strong work-ethic. 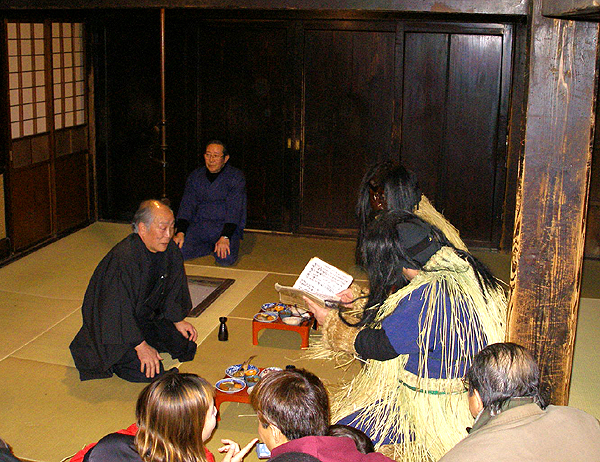 As the negotiations drag on, the head of the household offers more sake and along with mochi - rice cake - while begging that his wife and child not be taken away. Eventually the Namahage relent placated by the offerings and the sincerity of the head of the household. They bless the next year's harvest and wish good health to all the members of the household. As the Namahage leave, they promise (or rather threaten) to return next year. In olden times, communities in areas such as Oga could not afford the luxury of laziness especially with the winters as long and harsh as they are. It's not difficult to understand why community leaders would have gone to such efforts to instill a strong work ethic in their youth. Today the ritual is traditional. In the past it was a more serious matter - teaching the youth to work hard for their community's survival and their own. 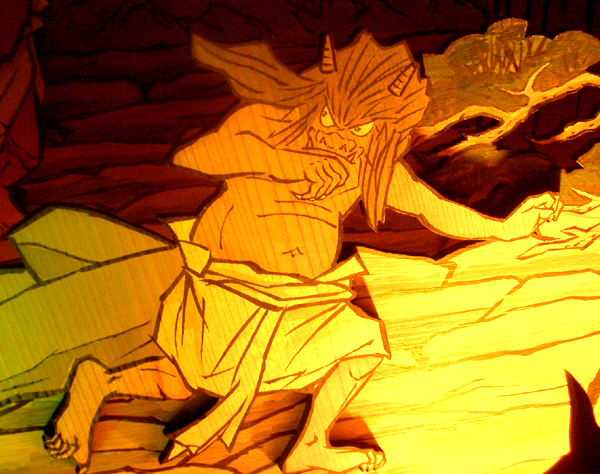 The original legend runs that the Namahage Devils arrived from China and caused the people of Oga much trouble. 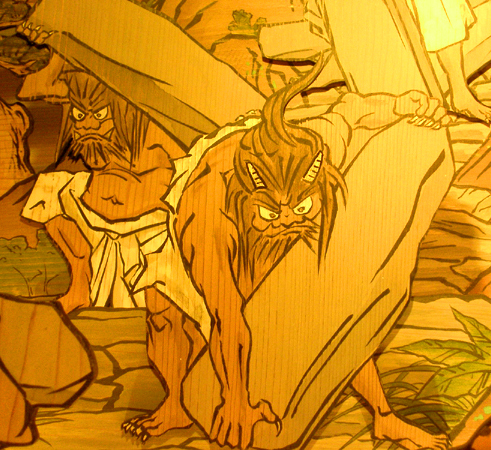 A deal was struck between the people and the Namahage that if the Namahage could build a thousand-step staircase for the main shrine in a single night, the people would supply them with a young woman every year; but if they failed, they would leave the people alone. 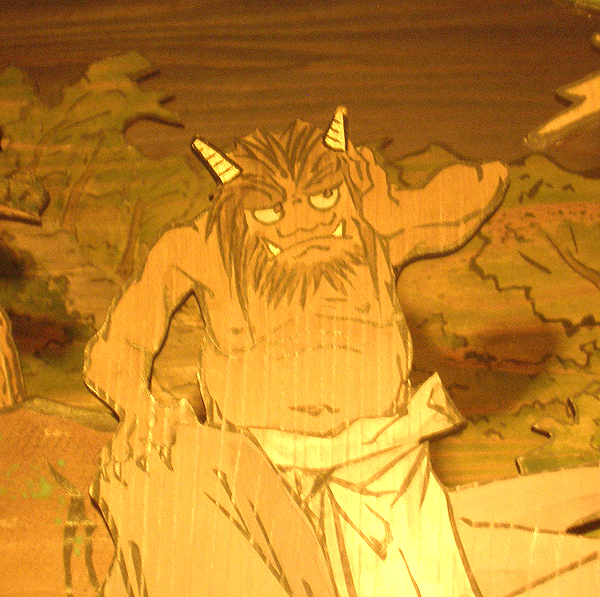 The Namahage readily agreed and set to work. The lusty devils were so efficient that by the end of the night they had only one stone left to lay before dawn even hinted in the sky. One fast-thinking person however came to the rescue and mimicked the cry of a rooster thus signaling that dawn had arrived. 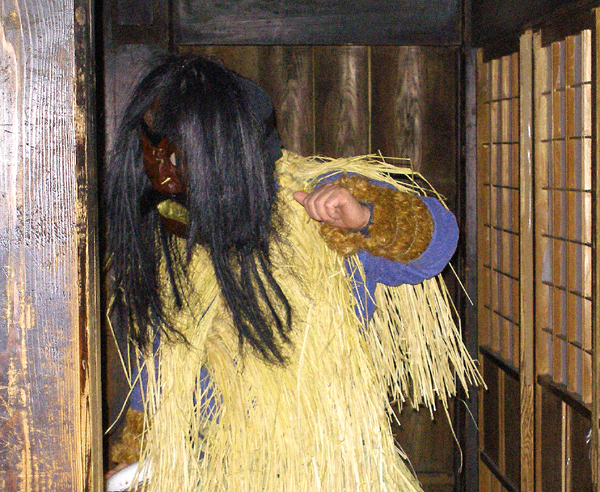 The Namahage, believing they had lost, left and went into the mountains but they return every year for their pound of flesh. 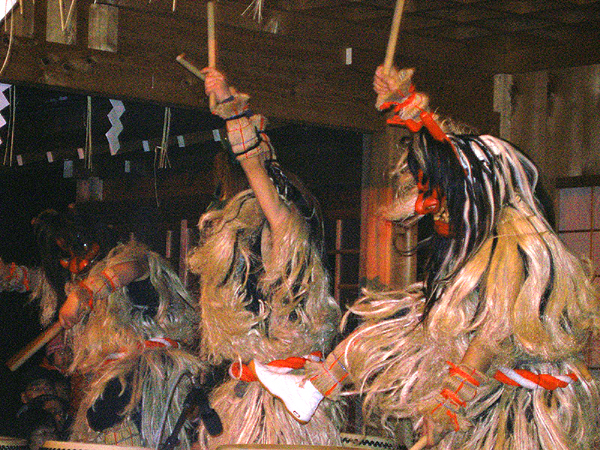 There are several theories as to the origins of the Namahage. 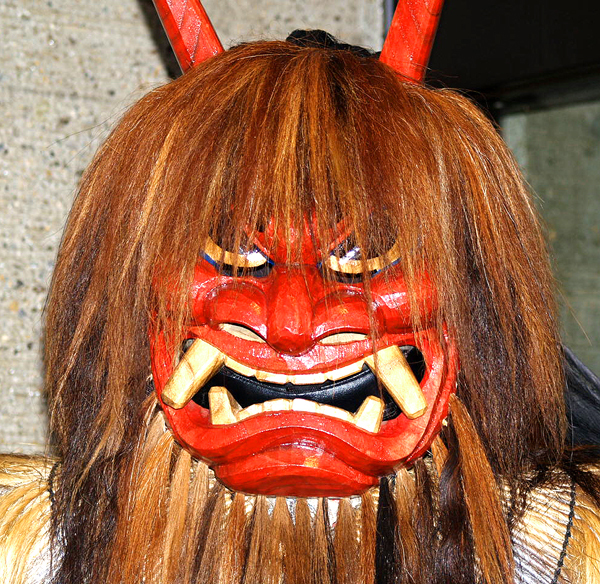 One theory is that Namahage are derived from an ancient mountain deity. 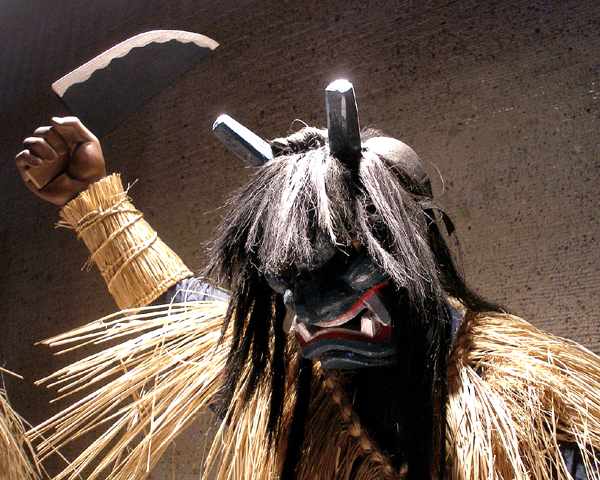 There are many native traditions of gods coming for a visit - though not quite with the fanfare of the Namahage. 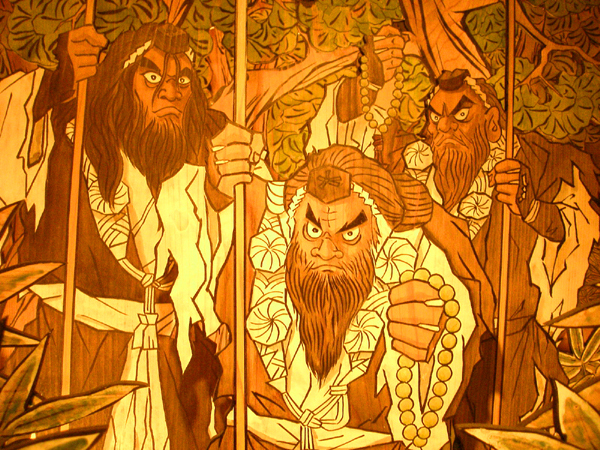 Another theory is that they are based on Yamabushi - Shinto priest who leaved hermit-like existence in the mountain. 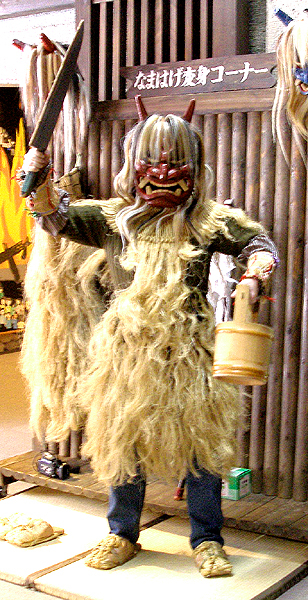 The name "namahage" comes from the local dialect. "Nama" refers to the patch of skin that forms on the skin if someone sits too long at the fire, i.e. being lazy. 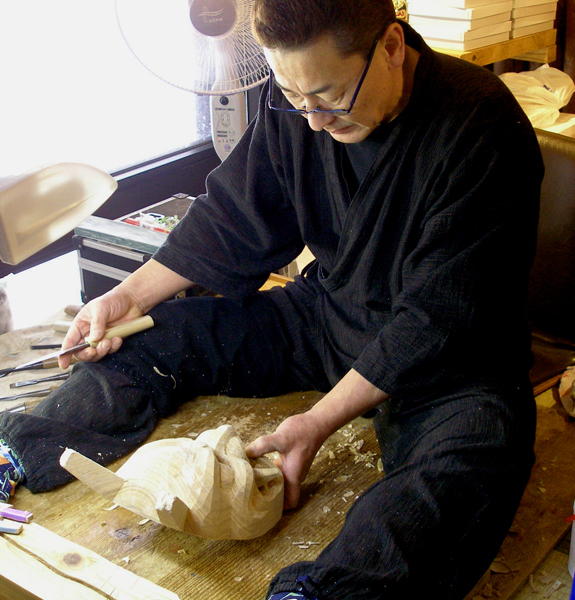 "Hage" means to scrap away the mark. 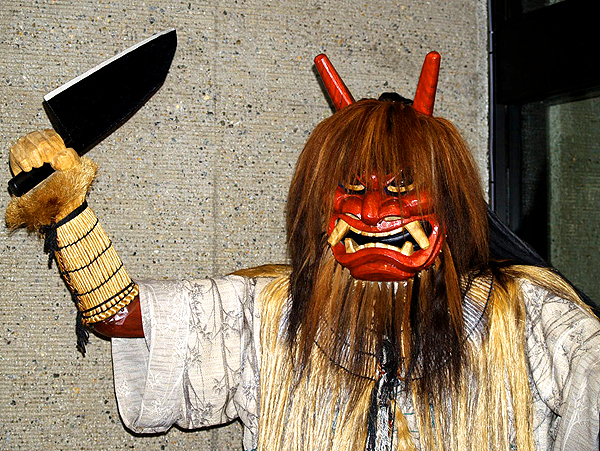 This is why the Namahage carry their large knives to scrape away the laziness of their victims. 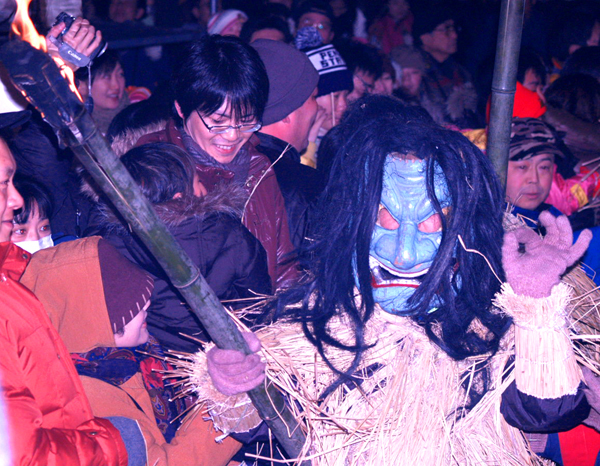 For travelers, New Years is not a good time to see Namahage as it's primarily a private affair. Participating households don't want a bunch of camera-flashing tourists to ruin the effect of scaring their kids straight. Some of the local hotels arrange Namahage visitations but given it's the New Years the whole thing can be rather pricey. 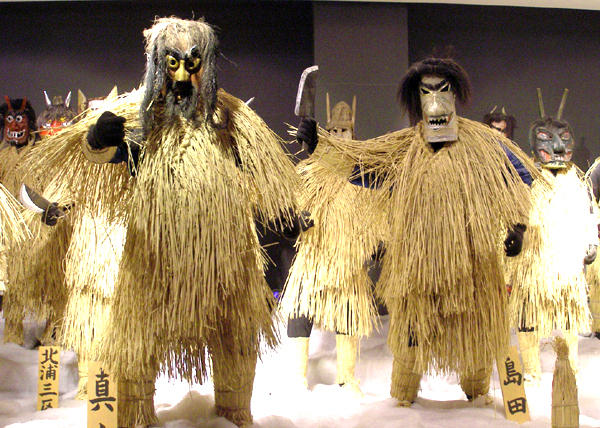 Fortunately for the Namahage-seeker, there is the Namahage Museum in Oga where year-round, they can see a performance of the New Years' event sans the crying children. 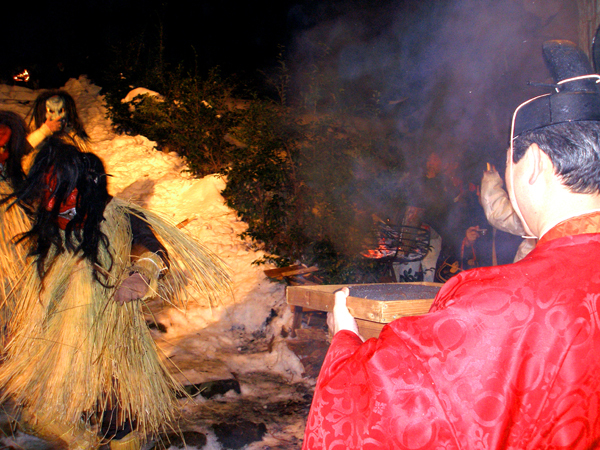 In February, there is the Sedo Matsuri or simply the Namahage Festival which takes place next to the Namahage Museum in Oga. In the evening several men come down a hillside wearing straw coats. 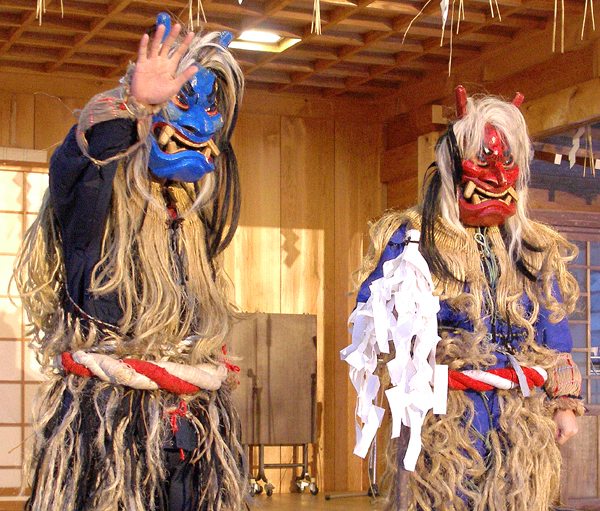 Near the shrine, two Shinto priests bless Namahage masks then proceed to mask the men. Once they are all masked, they begin stomping and howling. Thus the Namahage are born. 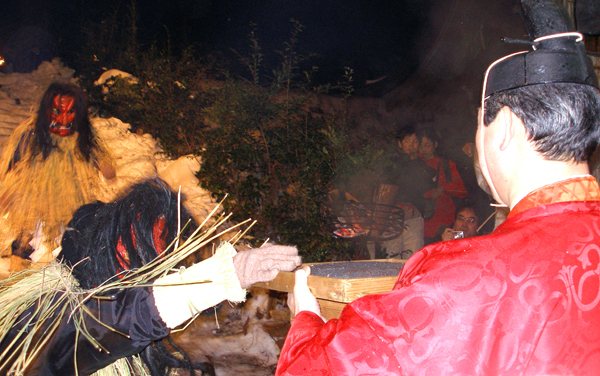 At the end of the festival, a priest presents an offering of mochi burnt black on a fire. 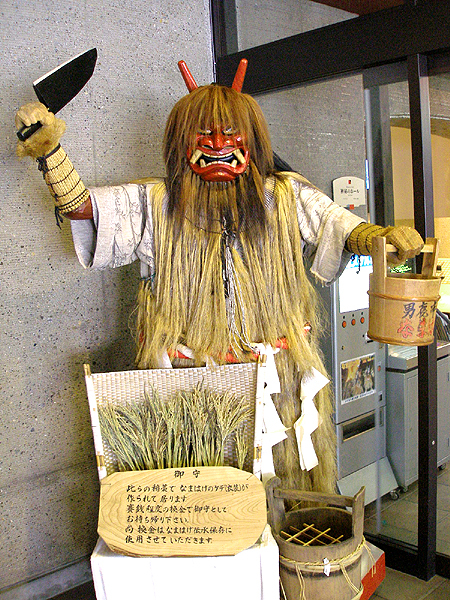 The Namahage grudgingly accept the offering then return to their mountain lair. 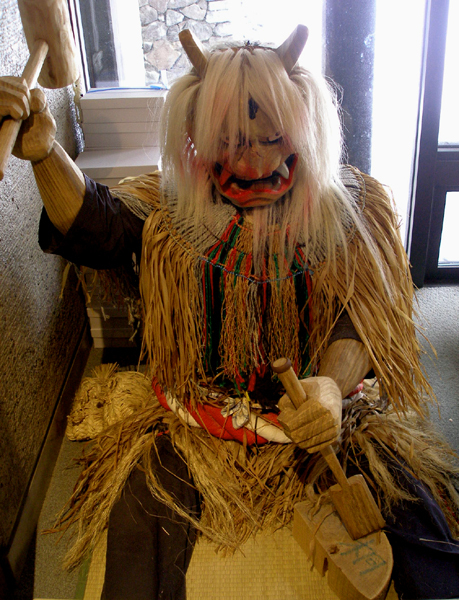 But everyone knows the Namahage keep watch on them and will be back without fail next year.